Event and wedding planner offering full service florist. 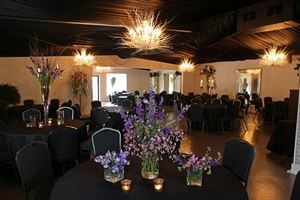 2400 sf newly renovated event space with custom chandeliers, sound system and shaded courtyard with fountain. Perfect for any event! Tables, chairs and setup included in the price. Table linens and chair covers available for rent, as well as backdrops, props and candelabras. Flowers, floral designs and decorating available on or off site. Contact us today for a no obligation venue showing or wedding/party consultation. Price includes tables, chairs and setup. Morning or early afternoon meeting times based on availability. Weeknight reception or meeting rate includes tables, chairs and setup. Linens, chair covers and other services available upon request. Package price does not include tax. Package terms will be addressed in rental contract and disclosed before booking. Friday night rate includes tables, chairs and setup. Maximum attendees varies based on event type. Package price does not include tax. Saturday night rate includes tables, chairs and setup. Additional services available upon request. Maximum number of attendees varies based on event type.